Family and friends of current World Mission Society Church of God members that we speak with, often can not understand the member’s involvement with the organization, much less why it is so difficult for the member to leave even after being made aware of various contradictions in the group’s doctrine, activities, and leadership. So why is it so hard for members to leave the World Mission Society Church of God? Cult expert Margaret Singer explains the reasons why members find it difficult to leave destructive mind control organizations in her book titled “Cults In Our Midst“. I will list each of the reasons that Margaret Singer mentions and apply them to my experience and discussions that I and others have had during our time in the WMSCOG. Deception in the recruitment process and throughout membership was a big stumbling block for many. The WMSCOG recruiters I knew were not exactly forthcoming with their beliefs when attempting to recruit members in shopping malls and on college campuses. While WMSCOG recruiters will stop people and ask them if they “have ever heard of god the mother in the Bible“, they fail to mention that the “god the mother” they believe in is a Korean lady named Zhang Gil Jah. WMSCOG members I knew also evaded new recruits’ questions about who Ahnsahnghong and Zhang Gil Jah were. The common answer to these questions from the WMSCOG members was “don’t worry about that, you need to study more“. It is interesting to note that the “studies” pertaining to who Ahnsahnghong and Zhang Gil Jah were, were taught last on the list of basic studies. A former member recently posted her similar observations from her experience on Youtube. Click here to see part 1 and part 2. Because of the hours, the degree of commitment, the psychological pressures, and the inner constriction and strife, many members found the experience to be personally exhausting and debilitating. There was great pressure put on new recruits to finish the list of basic studies as quickly as possible. The new member was slowly pressured to spend more and more time studying with members of the organization. Once the basic studies were completed, the newly indoctrinated member was pressured to go out and recruit more new members. The pressure from the organization to “bear ten talents” or recruit ten more donating members became very time consuming. 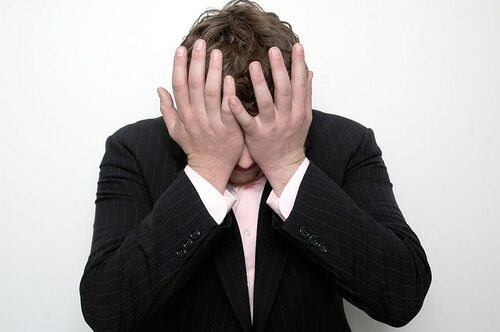 Recruiters often experienced disappointment in the amount of rejection experienced during the many hours of recruiting. As the demand for the member’s time increased, the members were often forced to choose between the WMSCOG and their education or career goals, spending time with friends, family, etc. The WMSCOG’s black and white perspective on “what is more important, (insert here) or God?” usually succeeded in getting the new member to choose the organization’s agenda over their own priorities. Dependency on the group increased as a result of being cut off from the outside world. Successfully indoctrinated members initially attempted to recruit those closest to them (or “low hanging fruit” as they called it). Family and friends usually resist for a number of reasons like the personality changes in the new member or the increased amount of time the member spends at the organization. The WMSCOG taught the new member to dismiss this resistance with statements like “satan will use those closest to you to try to stop you from coming to the truth” and “don’t worry, your friends and family members will eventually come, you just have to continue to learn more and become a better example“. In many cases, this approach completely dismantled the member’s prior support system and replaced it with the organization. I personally know several members who left their spouses because they were unable to reconcile over church involvement. If a member is dependent upon the group, then where would they turn to if they were to leave? The WMSCOG’s claims concerning protection from natural disasters and salvation concerning keeping the Passover, as only they observe it and other feasts (even though they observe the feasts incorrectly), can cause dread in members. Consider things that I heard like “former members are spiritually dead”, will “burn in hell for all of eternity”, will “not be protected from disasters” (see the WMSCOG’s apocalyptic theories), may “get into a fatal car accident”, or become “severely ill”. The fear that any of these will occur if the member leaves, I am sure is more than enough to make some members remain prisoners within this organization. If you’re lucky enough to never have been a member, you can get some sense of the fear-mongering that goes on by watching some of the twisted videos they have plastered all over YouTube, like this one. Take a simple disaster, then twist it to your own advantage. I saw this done very frequently, and it’s intellectually dishonest. Disasters happen all over the world all the time. Trying to exploit these to your own advantage is a bit disconcerting. Not to mention, that the WMSCOG in New Zealand was damaged by an earthquake earlier this year. Desensitization occurred so that things that once troubled members no longer did. WMSCOG members were encouraged to dismiss all criticism about the organization, regardless of its validity. WMSCOG members easily dismiss all criticism as persecution and do not accurately address the criticism. When I point out contradictions like how Ahnsahnghong never claimed to be god, or that he contradicted the Bible, or how they twist scripture and take things out of context, the WMSCOG members that I have spoken to do not address the contradiction and quickly change the subject. WMSCOG members also donate significant amounts of their salary through tithes and freewill offerings even though there is no transparency as to what the money is being used for. All of the above tactics work together and prevent the member from seeing a way out of the organization. This helps explain why your friends and family have trouble leaving in spite of all the contradictions. My sister was recruited in this organization. All of a sudden, she is telling us that we will go to hell and that we are satan-worshippers. We are troubled with her behavior since she hates us as well because we are strong Roman Catholic followers. We already don’t know what to do with her for her to stop this. we have sent you an e-mail to follow up so that we can help. please let us know if it does not arrive. my dear sister, your sister knows the truth,and in most cases people fear the truth.your sister is actually trying to save your soul,it means she feels bad to see being destroyed.my advice is take time and listen to her and then make decision but bear in mind that even if you are sisters physically it does not stop God from taking only the sheep but not the goats.and never say she didn’t tell you.God bless you! Stop deceiving people with all your pagan doctrines. Remember the gods you are worshiping is false, they are Buddhist by birth. Still if you insist that they are gods, then you are definitely in the lake of fire. The devil has captured you, it is impossible for you to free yourself, because you have gone out of your mind to believe in God who were before 30 Buddhist. Just imagine who must captused them, it the devil. Brothers and sisters there is no need to be afraid of what they teach. Read the bible study it, make the teaching of Jesus christ come in your life, everything will be alright. Even after keeping the passover, disaster have come and people died. Do not be afraid, come out of this madness of WMSCOG. You will be free. Like many others who have commented,I have been losing a close family member to the WMSCOG. I really appreciate this site and I recently found it after doing some digging on WMSCOG’s peculiar interpretation of the bible. I am looking for some advice on how to convince my sister to see the church for what it really is. My sister has been a member for more nearly 2 years now and at first she threw herself into all of the studies, so of course my family became alarmed. She asked us to come for a study and come for a service one Saturday. I thought the study and the service was interesting, as I am a person who sees value and some truth in many different religions, however my openness to other faiths would not allow me to just accept everything they were saying as “truth.” Plus the 2 times I went to the church, I did not get a good vibe from it, and as other people have mentioned on this site, the energy of the members like they were sooooo happy to meet me and didn’t even know me, was very strange. Anyway, after my sister finished her studies she seemed to lighten up a little on her attendance and fanaticism, but then recently it started to get worse as she mentioned to us she wants to become a leader in the church. When my parents first worried that the church was a cult, I tried to reassure them not to worry that they just have different beliefs than a traditional Christian church but they aren’t trying to harm anyone. That’s what I thought at first, and although I couldn’t get with all of my sisters beliefs, I wasn’t going to try to refute them because if the church made her feel at peace with God who was I to change her mind. However now my stance is changing and I’m starting to feel compelled to pull her away from the church and show her all the inconsistencies. I’m concerned about her continuing to sacrifice so much for the church (TIME, MONEY & SANITY) thinking that shes doing it for God questioning everything outside the church without even questioning anything inside the church. I think this website will help me pull together sources of info to perhaps show her, but is there any advice on how I can do it in a way that isn’t trying to prove anything to her, but instead be a catalyst so that she will at least attempt to see things from a critical eye? My sister can be very stubborn and I’m scared she will just brush this off as another attack on the church without even considering any of the information. But at the same time she has always been very interested in bible study that’s how the church was able to recruit her, so perhaps if I can line up the inconsistencies in their interpretations of the bible to show her, perhaps that will be a starting point. Any advice on what may have worked on other former members would be helpful; I read some of the former member testimonies but it seems a lot of former members begin having their own doubts without considering the influence of family doubts, so Im wondering if its going to be something my sister has to wake up one day and see on her own, or if someone like me from the outside can give her a push? Thank you and sorry for the long thread! thank you for your compliments on the site. very glad to hear it has helped you. very sorry to hear about your family member. we have sent you more information via e-mail to follow up. please let us know if you do not receive it. I need help please! I have a 26th old son that is in this crazy church and I am having a hard time trying to convince him that they are not right. I’m not gonna make this a long note but please if you can help me I would greatly appreciate it cause I don’t know what to do and he lives in a different state I do. It’s really stressful and I need all the help I can get. Thank you! My brother is going through the exact same thing can you please send me anything that will help me!! please!! I’m extremely scared for him. read the post on this site an interview with the NCPOG disproves the existence of mother god and read your blogs too. we are asking many questions but we can’t seem to get an answer. I am very concerned about how these people twist the bible verses. They put the fear of not receiving salvation and following satan into their members. I have three family members that attend “bible study”. It is consuming them. They tried to get me to join – and I resisted and still resist. Their members are told everything that is in direct opposition to their teachings is a “lie”especially the internet. I want my relatives to research the “lessons” and find out what is really true. Can you help? Hello patrice and thank you for commenting. I am sorry to hear about your family members. In the Biblical Misinterpretations section of this website you will find examples of the scripture twisting practiced by the WMSCOG. Hope this helps. Note I’m catholic person who has my wife attending this sect. She was catholic too, but found someone in the supermarket who approched and talked to her about 2nd coming of crist and she decided to visit them. This was her worst decision since she is still attending and no matter what I have showed her all about your excellent info in this website and how wrong this organisation is, she is still not convinced. It has separated our family apart. Can you guys help me convince her that the sect she’s been currently attending is wrong. We are very desperate with this situation going on. hi there. please check your e-mail for a reply from me. I am so happy to have found this site and all the information regarding this group. My son and his wife are members. I have all the same worries and problems others have. In fact, I thought ‘concernedcitizen’ was reading my mind! My family needs help opening my son’s eyes! Any help would be greatly appreciated. ANY HELP! hi there Gregory. you might try asking in our forum. there are many former members there who may be able to assist you. Love is the key to rescuing your son and his wife. This group spends a great deal of time talking about how they love and how Zahng aka mother loves. This group will do everything they can to separate your son from his support system and replace it with themselves. The fact that his wife is with him in this thing is going to make it more difficult. Make sure that you get her parents involved in your effort as well. Remind them about all of the good times they have had in the past. All of the love that has been shared within your family and how you still love him without any strings attached. Keep in regular contact with him. Do not separate or cut him off, this is what this group wants. You have found a great source if information here. Learn what you can and ask out of the box questions but be careful. You want to seem interested but not confrontational. Judgement from you will only push him into this group further. If his wife seems less convinced about their choice of faiths then you might want to ask her some of the more difficult questions you’ll find here. Once again, seem curious but not confrontational. Right now they have been told that you will not understand what they have learned because the truth is not in you. This group uses many mind control tactics like this and by labeling everything they say as the truth it makes anything to the contrary a lie. The father of lies is Satan so if you are bringing so called lies to them they will view you as a follower of Satan. Please pay close attention to what I have shared with you. If you spend your time just trying to prove the WMSCOG wrong you are going to look very bad in their eyes and you will lose your son for a much longer time. Please read your Bible if you’re not in the habit of doing so. Read Galations as part of this is what this group uses to prove there is a god the mother. When read in context it doesn’t support the theory of god the mother. In Revelation there are dimentions for New Jerusalem. If mother is New Jerusalem then she would have to have certain characteristics which this lady and no person could ever have! This might be a starting place for a conversation but remember, do not be confrontational! Act curious and when he gives you an answer for things like this and they seem obviously wrong don’t try to shake him out of it with this! You will have already placed a problem out there and more questions will come into his mind. Sooner or later the truth will win out. No one stays in a cult forever. Keep praying and keep your faith in the one true God. TH.– This is a beautifully written post and the best advice I’ve seen. I was in this church for almost 4 years, and I left almost a year ago. It has taken me until now to finally seek closure and healing from the whole experience. If I was still a member, this would be the utmost ideal way for a loved one or family member to approach the situation. Thank you so much for posting this. @ Ed apparently ASH (AKA “Father”) wrote on his hand-written notes that he follows “Mother” and that (according to the wmscog members) means we should too. Also, they say that the reason he wrote that book to deny a heavenly mother was because her time had not come yet and so he had to reveal her at the right time, since that other woman who was claiming to be the heavenly mother was lying through her teeth after stealing and going through his (ASH’s) notes…but how is that true? What do you have to say about it and also the claim that ASH revealed Zahng as Mother through the parable of the wedding banquet at a wedding hall when he celebrated his last Passover. Ed how true are all of these claims? If you follow the history of Ahn and his family you will find that his actual mother (the one who gave birth to him) was the first one to enter into the Seventh Day Adventist Cult. 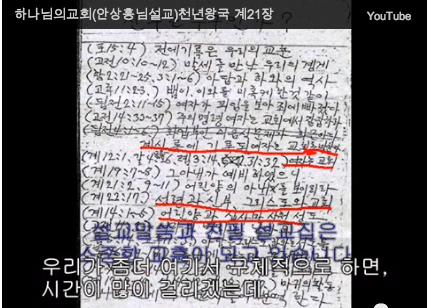 In Ahn’s notes he clearly stated that he followed mother. What’s more reasonable? 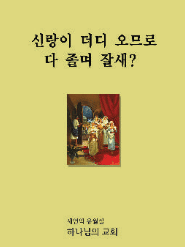 Ahn following his mom into a new faith or the idea that he revealed a new god which he actively preached against? Ahn was a believer of Jesus Christ and taught that Jesus was the only way to salvation. All it takes is research done on your own outside of this groups influence and you will learn these truthes. By the way, in reguards to Ahn’s book disputing god the mother, he states that there is no god the mother. The WMSCOG claims that he revealed god the mother. If Ahn did this then he was lying one way or the other. This is not something that can be explained away! This brings up the question, does God lie? Ahn cannot be God because one way or another there is a lie here. If Ahn was not God then God did not reveal a god the mother therefore whoever did brought forth a lie and the father of all lies is Satan. Do you really want to be following Satan? Oh and God, who HATES false gods would never come to earth (again) and worship a false god. It just can’t happen no matter what their excuse. God would not ever under any circumstance worship a false god. To say that God, creator of all, worshiped budah is so utterly absurd it just may be the most absurd statement, EVER. My daughter is involed in this horrible group as well. Is there anyway I can get the book that says there is no mother god? I’m desperate! Help.. My Daughter who lives clear across the country has been involved with WMSCOG since August 2012. We are going to fly out and visit her soon and I want to know if there’s anything we can do to persuade her to leave this cult. I want to know the best way to handle things with her. Please give me any guidance you can. Thank you. Joanne, private message me on the forum. I may be able to give you some information or advice. Anyone on here would be willing to help. I am in a somewhat similar situation as my loved one in this group is also far away, and it makes it tougher to help them. Anyway, if you would like to talk, I’d be willing to make time for you. I’m glad that you had the spiritual eyes to see through the lies before it was too late. JA be thanking God for having your back. This could have destroyed you. I’m glad it didn’t. A Mother who loves her son. Thank you T.H. for your comments on December 5, 2012. I have been trying to find answers to my 24 year old son’s change in his behavior. One of his high school classmates is the leader of the CULT society church he attends. At first I thought it was a positive influence, but a year later – no job, no vehicle, no girlfriend, no friends, no apartment, no social life. He moved in with me in August and has not done anything but listen to music (his job making “mix tapes”) and not contribute anything to the household 5 months later. He tells me, his father (who I am divorced from) and sister that “we don’t see what he is doing” “we dont understand” A lot of prophecy talk. Being a mom, I have been very patient with my son because I love him dearly. This experience has created a division between us. I want my son back. I plan on keeping him away from this group as much I can in the future. Slowly seperating him from “the society” with God’s help, love and prayers. Thank you again. Thank you for the complement. I have over a years experience with this particular group and its members. Most of the time it takes a combination of events to create an effective exit for the member. Keep doing what I suggested before. As long as there is someone on the outside that loves him he will feel that he has a place to go when he decides to leave the group. The other thing that usually happens is that the group does or says something that places doubt in the member. This whole “Father Ahn is coming back at the end of 2012” has been a biggie. Ask him how he feels about this. Don’t be confrontational about it! Be lovingly curious. See what he thinks and what they have been telling him. He probably already has his doubts but is being convinced that it is an attack by Satan to take him away from his faith in Father and Mother. Don’t be discouraged by this, just listen to him and show him you care. Keep strong in your faith and understand, no one stays in forever! It’s being a year since you wrote this post, but I’m curios to ask. Did you ever leave the cult and did you find a different place where to study the bible, would you please post an update..?? My reason to the question is because, before I lost my girlfriend to this cult I went in for about three months and took studies but I was never fully convinced of their teaching. I should mention that I was a Catholic with less than basic knowledge of the bible. I’m too critical and too analytical. I use a combination of belief, logic and common sense, and I do plenty of research as well, before making a desition. Unfortunately, my girlfriend is a strong Bible believer like you and she’s not much of an analytical person as I am, therefore, I ended up losing her. Believe me when I say I understand your confusion. One of my family members was involved in this group for about the same amount of time as you have been. Which church keeps the passover, the feasts of God, the Sabbath day, veil teachings etc. This is one of the big trapping points of the WMSCOG. They make you believe that if a church is not doing these things then they are a false church. If this is true then Paul was misleading people when he spoke about things like womens veils. He asked the question, is it right that a womans head should be uncovered? Then he said that if God blessed a woman with a head full of hair it was as a cover. He followed up this information with a statement about women having to cover their heads saying that we have no such custom. Please don’t stay trapped by the misleading of the WMSCOG. Obviously this group is trying to keep you plugged into their program but I want to encourage you to take some time away (at least 4 months or more) let your head clear, and then do some in debth research. You will find that most of the things that the WMSCOG have taught you will not hold up. The Bible doesn’t support some of their teachings, history doesn’t backup their teachings, some of their teachings contradict other teachings, and their own man made god doesn’t support the claims that the WMSCOG has made on his behalf. There are too many things wrong with the WMSCOG for them to be a real church much less have the “Truth”. There are many of us here who are willing to help you through this difficult time of discovery. We are not here to put you down or make you feel bad but to build you up and support you. Thank you for reaching out. Romans 6:9 CLEARLY states he can not die again. Now before WMS try and give their spin on things, FOCUS on the scripture. They believe Ahn is 2nd coming CHRIST. So, then he can’t die again IF he were to return. Ahn died. More importantly, WMS lied about that to. We were told that he left for China on a train, and that counted as “Ascension”. Then, it was revealed that he died of Natural causes. He is barried in South Korea. By definition, ascension does not deviate toward a descension back to Earth. Wms lies and lies. Congratulations, Laura, on the birth of your first child! What a blessing! Becoming a mother (for me) is such an amazing moment of overwhelming love for such a tiny and precious gift from God. It is also extremely exhausting :). Thank you for posting here. I can hear the sincerity in your “voice” and felt compelled to reach out to you. I understand, a little, of the confusion that you feel. I have been a life long believer and follower of Jesus Christ and have experienced several different churches and religious theologies. When my husband became involved in the WMSCOG, my world was turned upside down. I made a commitment to study the entire Bible from beginning to end on my own. Spend time in God’s word, just Him and me, letting Him reveal his love and wisdom to me without outside influence. It has been an amazing experience and my relationship with The Lord has grown in amazing ways. I admit that the few WMSCOG teachings that my husband put in front of me has shaken my understanding, and after over a year of study, I am still searching. When my husband was attending the WMSCOG, our relationship was horrible. We almost separated. But he is out now, and our relationship is growing stronger every day. I understand your concern for doing right by your child. I feel that everyday for my children. Our relationship with The Lord is a lifelong journey, a marathon, not a sprint. I know that a lot of churches seek to teach God’s Word in the way that the early followers of Jesus did. I am not sure if there is a one true church. It is my personal experience that I tend to stay away from churches who claim to be the “one true church” because the people have seemed to be better or above all others. This is my personal experience. I believe that God speaks to our hearts in individual ways. We are uniquly and wonderfully made. For me, Jesus Christ is the only way, truth and life. In my studies of the WMSCOG’s teachings they didn’t fully line up with God’s word as He revealed it to me. The first few weeks and months of new motherhood is a wonderful period of adjustment. Your body is going through a lot, physically, mentally and emotionally. I would say to you, if you are questioning things, to take this time to just be with your new family, get all the rest you can, eat well, and read the Bible alone, in context, without supplemental influence. Let God speak to you through His Word. I find the Psalms to be uplifting. Also, John and Hebrews are fabulous reads as well. This is what I believe with my whole heart – guilt and fear are not of God. If you decide to take a break from whatever church you are a part of you should not feel pressured from your peers. God will never leave you or forsake you. He knows our hearts, and that is where we meet Him. This child is a gift from Him. I cannot believe that a person will lose their salvation if they take time away from attending church to take care of His precious gift to us. Enjoy this time with your newborn. Sleep when the baby sleeps! Trust me on this :). Spend time in the Word. “We know that all things work together for good for those who love God, who are called according to His purpose.” Romans 8:28. Yor are in my prayers. Grace and peace to you. I also need some help here!!. Can you send me e-mail about how to pull one of my family member out of this church. I am afraid the one I love gona quit school soon because of spending too much time in the church. I was a former member of 6 years, I’m glad I’m no more a member there…! My husband and I spend too much money,time and energy onto this cult and had neglected our family members!! Deep inside my heart I knew all this was very wrong! They controlled us,mentally torturing us and the worst case they don’t do anything so that you have to listen to what they said and must obeyed or else they will mentally tortured you! I had ENOUGH OF IT and decided not to go anymore….now I’m a happier person, my husband and I and our son felt so much happier now without being a slave to this cult! Please be careful of them,they come to your life and destroy you slowly and FULLY!!!! I had a girl I met on the bus stop try to recruit me. She asked me if I believed in God, and then proceeded to tell me about their god mother. She invited me to her church and I told her I couldn’t. On the few days that I saw her she kept on persisting, and I thought it sounded interesting, so I decided to go with her to her church. She introduced me to people in the church and they all seemed very nice. Then she showed me a picture they had framed of their “god mother” and instantly I thought it was BS. But decided to hear what she had to say. So while inside a study room she showed me passages from the bible that pointed out that there was a god mother. I sounded very convincing and she was telling me that if I wanted to save myself I had to be baptized, she literally wanted to baptize me right then and them. After she was done, and although she kept pressing me on to get baptized, I told her no, I didn’t feel comfortable, and that I could not change my beliefs that there is only ONE God. She stopped talking to me, after being very nice and she would text me all the time. Then had another lady approach me at the super market (they were both Korean) and asked me if I believed in God, and blah blah blah, I stopped her in her tracks, I told her “If you’re going to tell me about ‘mother god’ don’t waste your time, I don’t want to be rude, but I don’t believe in it” She left right away. I understand if some women get an abortion because of financial and psychological collapse, but this has got to be the WORST REASON to get one. Wow! Are you serious? Not much time left, huh? I’m glad you didn’t give in to that advice either. Sunshine, could you come onto the forum and private message me? I have a couple questions. Thanks. I’m ShengCaiña and a current member of WMSCOG, I’m emotionally tortured in church… How can I leave? @Sheng …How you can leave? It’s a simple question that requires a simple answer… Just leave and do not attend to their church meetings anymore nor entertain their calls or visits. Better for you to leave because the more you stay the more you sin against your CREATOR. I have been thinking about the kinds of things parents do for their kids. Helping kids get over a crush that feels like the end of the world at the time. Answering those questions that are difficult at a time that catches a parent off guard. Do these children remember how their parents invited them to cuddle up with them on the couch and watch a movie especially when it was a children’s movie that most adults wouldn’t watch on their own? How about those times when a bump or a scrape felt like a part of them would never heal and the parents love and care made the pain seem not as bad? Why would anyone who had these types of memories let anyone come between them and their loved ones? If you are a member of the WMSCOG and you have replaced your family with this woman in Korea that doesn’t know your name and cannot hear your prayers or you’re praying to a dead Korean man who only taught Jesus Christ as the way to salvation, wake up! It’s time for you to reclaim your life, your family, and your own thought processes. How many times does the WMSCOG need to change their teachings before you realize that they are liars? Your God given family which raised you is where you need to be. If you need to swallow your pride in order to make things right then just do it! You deserve it and so does your family. Find the real love that you had before. Tim… I too was in the Reseda church and we know each other.. Itoo was part of this blinding cult that snuffs out the light of God and poisons people with lies.. I still have shell shock from the.wms and I need someone to talk to… please give me your email if possible thank you God Bless You and the best of luck at court..
That’s pretty incredible seeing as how some of this stuff comes from their own website. I think your friend may have mislead you. I was a member of that church. They are like Vipers in that place. They come and steal your souls and make you a slave to that place.It is a mind control institution and they use the bible just for that. I went there and some of the stuff that goes on in that place would make you realize that something isn’t right. Its greed, hypocrite, gossip, bitterness, envy, hatred, selfish ambitious, lies, and mind control strategies. They use scripture to control your whole life. The missionary communicate with each other about you so when you show up they accept you according to what the other missionary have told them about you when you go and visit other churches. They go after young people in colleges because they don’t know much about the bible and its easy to groom them. They have meetings about the members and monitor how they spend their time during the week. If you don’t have a job they tell you to get one because your tithes is important. They don’t preach to homeless people because they would be dependent on the church. They are very secretive they would ask you questions about your whole life and you would know nothing about theirs. They do research on their members and they judge you. They say they don’t talk about money but they are always collecting money for donations. They treat you like an outsiders if you cant be fully controlled. And this basically sums up what you can expect as a member of this group. I hope you are not interested in joining based on this information. If you are already a member you should instantly become disinterested. Thank you for posting this Randy. ATN Yes they a mind control organization that uses the bible as their way of convencing people about their only exclusive true. They change your personality in no time you won’t be FREE after they induct all their stories in your mind, by teachings, you will have no more time for family and friends, they will trap in their belivings,and those from a group, you wont be you anymore VERY SAD. ATN Yes they are a mind control organization that uses the bible as their way of convencing people about their only exclusive true. They change your personality in no time you won’t be FREE after they induct all their stories in your mind, by teachings, you will have no more time for family and friends, they will trap in their belivings,and those from a group, you wont be you anymore VERY SAD. My daughter has been involved with this cult for about a year now and I don’t know how to get her to see that they completely misinterpret the bible and the word of God. Please help! Leslie, I’m glad you came back. You leaving this group has nothing to do with proving anything to them. I understand that your boyfriend is in there and for his sake you want to show him the truth so he will leave also. This is not something you can do for him. He needs to make the decision to test what he’s being taught and seek out the truth. Your best course of action right now is to leave the group. This might just be the thing he needs to shake him out of the WMS. If you keep going with him it’s going to send mixed messages and he will feel that you are going to reengage with the WMS as long as you keep going. My loved one was told as long as they kept studying, praying, and preaching eventually the whole family would come into the WMS. None of us ever went but could you imagine the mixed message that my loved one would have felt if we had? You have to do the hard things and cut off all ties with the WMS right now. As for biblical information, there’s a mountain of it right in this website. Use it but understand this, the current members are not going to listen to you because the truth conflicts with what they want to believe is real. Until someone really wants the truth they are not going to see it when it’s presented to them. You can lead a horse to water but you can’t make it drink no matter how much it needs it. you admin n other blame Ahnsanghong is false christ. could you explain me then which one is the real fact church? to blame other are easy but it is not needed to blame but try to teach fact laws of bible to get salvation. do not judge other till lord’s come. if passover is false then what is right? if you dont know how could you judge by not knoing true teachings? i believe him as creator if you u visit wmscog then you will get good informations about their foundnation of faitb in Christ Ahnsanghong. if u were in the time of Jesus will u ask pharisees to know about Jesus is creator or not? if u ask with decieples of Jesus why do u believe him as christ then u will get the points. I keep hearing this question, “Which one is the real church?” How many people have used this argument to stay locked into this abusive controlling group? The bible teaches us that we are the church! Not some group! The church is inside of us. What you really need to be doing is cultivating your relationship with the ONE TRUE GOD that the Bible speaks of. Stop letting others tell you how to read things into the scriptures. When the bible says things like you will know they are false prophets when they make predictions and they don’t come true you should believe what the Bible says! Don’t you believe in the Bible? The WMSCOG says they do and then they PROVE that they don’t! As for judging others the Bible teaches that the way you judge others is the way that you will be judged. I invite this! Please judge the teachings of the WMSCOG just as you would the teachings of the Bible. I don’t mind admitting when I am wrong. The WMSCOG has a track history of just changing their truth when things don’t work out or when a teaching is found false of ineffective. The truth NEVER changes! The reason why the truth of the WMSCOG’s truth keeps changing is because it’s NOT the truth! Start visiting the ONE TRUE GOD and get away from the WMS! A man that I dated and I believe truly cared for me, punishes himself daily because of his “earthly desires”. They have conditioned him to ignore his emotions and be cold. He believes he committed carnal sins in heaven and that’s why he was expelled from heaven. He refrains from intimacy because he doesn’t want to commit those sins anymore. He believes in father/mother God. I don’t think he has researched them enough because they tell him not to because people, like the ones that ridiculed Jesus, will speak badly of his father mother God. He spends all his time in church, with bible studies and so forth. They keep him up late with the studies and he’s always so tired and napping. He stays in a bad mood. He has disconnected himself from his family. What can I do, or say, so he can initiate questioning these people? Hope, please go to the forum and find the message about how there is no way that there is a god the mother. Several people who have left this group started with this simple idea. I agree with Mountainmom that talking someone out of this group is not really possible. A member has to make some discoveries about the truth on their own before they decide to leave. What you need to do is just ask questions that will lead this man down a path to the truth. You must be very careful about how you do this. If he feels that you are in some way threatening you might just cause him to go further into the group. Be loving and act curious with your questions. If he feels like you are at lease a little bit interested he won’t feel so threatened by your questions. Hope ask your husband why would God give Solomon so many wives and concubines if such things were to be considered sinful? Did god make Solomon sin by granting him all the desires of the flesh? did not Crist turn water into wine did he make his disciples sin NO. NO such thing are not sinful they are just natural things. where in the bible does it say such things are sin? TH, who posted just above you gives a pretty good argument. I can’t tell you that anything anyone says will help this man, though. I haven’t seen anyone talked out of this group, really. I have seen interventions work (and some that haven’t) and I have seen people leave on their own, but no one has come on here and said how they have talked someone out, that I know of. All you can do is off them unconditional love and refrain from talking badly about their beliefs, because they have already been very schooled on how to argue with people, and basically anyone who tries to talk them out of it becomes some kind of “agent of Satan” to them. That is what they are taught. Go to the forum here and start posting and talking to people who have already dealt with this. Read all you can about how to deal with it, and talk to people who have been in your position. We are all willing to help. There is too much to consider to just put on here, but you will make connections on the site who can help you. Good luck. I have been with this cult for 6 months help me to get out from there and there pressure me if i leave i will go to hell after i die! Dian your a coward and what you still don’t have a life? lol. did you get your money back yet lol though I would take a look after 2 years and still nothing new hear. Mred, what are you talking about? Who is Dian? Why did someone take her money, and why are you calling her a coward? Lol? I have to admit, Mred, your comment makes you seem very mean spirited. Are you?It appears as a taunt of some kind. Is that how you really meant it? Wow, someone must have told Mred to stop representing the “church” in a bad light. I still am wondering what he meant about someone taking Dian’s money. Many might assume, since he won’t reply, that the Wms somehow got a lot of her money and now that she knows they are a scam, she has tried to get it back. That doesn’t sound cowardly. It sounds like she is mad and is a fighter. Just my opinion. If someone or something bleeds a person’s finances dry and then taunts them about their major financial loss, just how many people would want to be associated with this? And what kind of people would laugh at another’s pain? Is that why you were told (just conjecture here) to shut up? I am Prabha from India.My sister came across some one from WMSCOG in college, she became a believer there, systematically everything in my house changed, my parents changed, few of my relatives changed… even I am badly forced to change… but I still want to stand firm for the Lord. I am hated by my own family. Please help me with some evidences and material to bring them back to the Lord. Please. Let the Kingdom of our Lord Jesus rise.Amen. I am arvind from India.My brother came across some one from WMSCOG in college, he became a believer there, I and my family is badly forced to change… but we still want to stand firm for the Lord. Please help me with some evidences and material to bring them back to the Lord. Please. Hi all and to T.H, I have read all of your comments, both negative and positive about this group – WMSCOG. There are some Zions in Hanoi and around Vietnam, for sure. I personally have a sense of CHAOS within the Earth, among nations and the Judgement Day before one of the followers talks to me in the Banking Academy campus. Please, T.H, and others who knows the truth about this, please tell me how to leave this group. Hello Lee MIB, as you called me out directly I feel that I must reply. Over the years that I have witnessed this group there have been very few times that violence has happened. I would not worry about that possibility too much. As for these people who claim that they will not let you go it’s really not up to them! You are the one with the authority to decide if you are going to stay or go. I would encourage you to make a very distinct declaration that you do not believe in what they are teaching and that you would like them to leave you alone! It is very unfortunate that your parents don’t want you purchase a Bible. There are many contradictions that are made between the Bible and what the WMSCOG teaches. The biggest contradiction is that the Bible teaches that there is ONE TRUE GOD while the WMSCOG twists scripture to try and make it seem like there are two gods. I’m glad that you feel the confusion inside of you over this. In some of my other studies I have discovered that when something is really confusing and doesn’t seem to measure up it’s usually a sign of something very bad. I might even go so far as to say evil. Many people become desensitized to this feeling over time and even get convinced that if things being said conflict with what they are saying then that is what is bad. Lee, please take this one piece of advice from me right now, cut off all ties with this group and if they come looking for you tell them straight up that you don’t believe what they believe and that you want to be left alone. My Bestfriend has been going for a few months im scared… She doesn’t believe what im trying to tell her… how do I get it thru to her or get help??? My daughter is 21 and away in another state for college. She recently becr abe for this church. And was introduced by this 25 yr old guy she met. She called me crying not sure how or when but just found out they are legally married now. She remeber sign church papefwork, but never agreed to get married. Also she spends almost every waking moment at this church what can I do to help. Please help a desperate mother. Ash, how committed are you to bringing this man to the truth? This thing that you are asking about is very complex and in many cases requires years of dedication. No one is beyond hope and no one stays in a cult forever.